Dante's Ulysses is very different than Homer's. Dante never had a copy of the Iliad nor the Odyssey, he described the hero on the basis of Virgil's Aeneid and various references to Homer in medieval sources, and of course his own inventive genius. Dante the pilgrim meets Ulysses in canto 26 of the Inferno. We are in the 8th Circle, 8th bolge in the middle of the false counselors. Ulysses is condemned to hell, when he was a mythological hero through the whole of antiquity, because he brought about the fall of Troy by his most brilliant strategem of all: the perfidious deceit of the Trojan Horse. There is more: Dante’s Ulysses never even returns home to his faithful wife Penelope, Telemachus his son and Laërtes his father; nor does he show any repentance for this failure of familial duty. Dante invented an entirely different ending to his story. He imagines that Ulysses had sailed through the Pillars of Hercules – the Straits of Gibraltar – beyond the Mediterranean Sea to the end of the world, a journey forbidden to men, and tried to reach a mysterious mountain in the middle of the Ocean. It is evident that this Mountain is nothing less than the Mount of Purgatory itself. In a sense, we might say that Dante accuses Ulysses of attempting to steal his salvation, not be the way of penitence for his sin, but through outwitting God. So Ulysses becomes the symbol of an immoral lust for forbidden knowledge, as opposed to the virtuous desire for a spiritual illumination whose source is God. 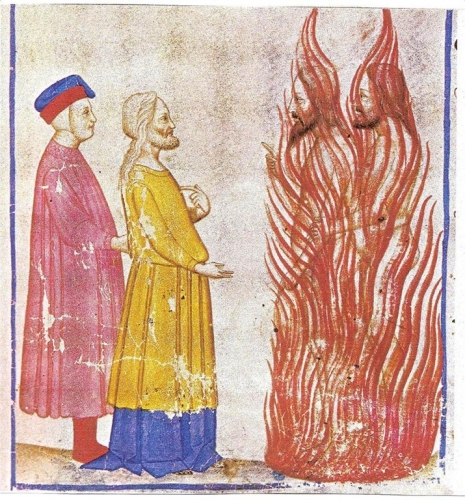 Dante used the heroic figure from antiquity to express a sharp distinction in thirteenth-century thought between the kind of human knowledge driven by curiosity – curiositas – and a knowledge given by God in a descent of the light into the soul, a moral illumination. In his recent novel, Le Vestibule des lâches, Philippe Fretz's, has introduced a noticable dantesque Ulysses figure into contemporary literature. The short novel tells the encounter of its hero Jeremy Carter with the character of the Villain, Michel Barquet. The «vestibule des lâches» literally the «vestibule of the cowards» – places us in a dantesque frame of reference. This vestibule of Hell is the place where those who never chose between good and evil are continually stung by wasps as they run aimlessly after a meaningless flag. The next space they enter is a restaurant called the «Mortimer». It's a direct reference to hell, where death – la mort – is orchestrated in an endless timer, condemnation. Carter will go through hell during the time of a banquet – a convivio (the title of Dante’s major treatise) where his soul will be weighed. The location of the scene is very specific, the restaurant is located at the 8 of the «rue Verdaine», which corresponds to the 8th circle. Later, the description of the waiter that seats them group. «Le garçon au visage honnête» («the honest face») corresponds to a characteristic of Geryon who weighs the condemned souls. He is described by Dante with the body of a winged snake, a long tail and... an honest face. He will seat Carter and Bertran Rothe at the table number 8, which is the 8th bolge of the 8th circle, the bolge of the perfidious counselors. That's the Bolge where Dante and Virgil meet Ulysses in the divine comedy in the 26th canto. The meeting of Carter and Barquet has other parallels with Dante and Ulysses, We have this strange locution «La poisse suintait comme de la main gauche d’un jambon de Parme», it has no other explanation possible than a reference to the troubled Dante Alighieri Society of Parma which one of the oldest in Italy. Dante's Ulysses becomes a mythological villain who has used his intelligence and skill as a counselor to take over the sacred and impregnable city of Troy. He becomes a sort of Promethean figure, one who stole fire from the Gods. It’s even more complex than that. He is also a mirror of Dante. He represents what Dante is afraid he might become through his own Odyssey to God. Dante says it in the second canto of the Inferno, «I am not Aeneas, nor am I Paul.» What is his legitimacy for doing his journey? Both Dante and Ulysses seek a greater good; the tension is in how they choose the way. To gain the goal by their own efforts and wit, or to receive it as a gift. An other key to Fretz's novel is the relationship between Barquet father and son with the son’s confused loyalty to his father. In fact, the one guilty of an act of false counseling – of deception and falsification – is Barquet the father. Look at what Edouard Barquet is after: to use a valueless stock option in a company called «Tango Troya» to defraud HSWC out of 120 million. The name of the company «Tango Troya» lets us think that it’s Barquet’s version of the Trojan Horse trick. His little «Trojan Tango» is a masterpiece of duplicitous counseling. The son simply cooperates in his father’s fraudulent scheme; he obeys his father’s authority, a sort of weak version of Homer’s Telemachus. Troy is the city of all promises. It's the paradise atop Mount Purgatory. Ulysses was punished when he sailed through the Straits of Gibraltor, beyond the confines of the Mediterranean, in search of a paradise that he could take by force, a paradise not received by grace, but stolen. He never returned to Ithaca; he was never heard from again. There is a direct allusion to that when Edouard Barquet meets Gogol in an HSWC office to prepare their felony, they sit around a glass table (a figure of the Mediterranean Sea). A secretary brings two bottles of water, one from «Rochers de Calpes» – that’s the Rock of Gibraltar in Latin – and the other from «Mount Abyle», which is on the North African side. They represent the Pillars of Hercules, beyond which lies the unknown and forbidden world. Yet the accusation against the son Michel is wrong. It's the father figure thats should receive a punition for his trespassing and his bold provocation to the Gods. The feminine character Olga in Fretz's novel is Jeremy carter's Beatrice. She escapes the natural determination of following in one's parents’ footsteps. She escapes her father, Gogol's power, and in that way inspires Carter, like Beatrice inspires Dante, for a rejection of evil. She becomes his protector and his temptation. Finally his inspiration and source of light. In the last scene, she telephones Carter, inviting him to see her. The scene takes place in the central hall of a train station. Bertram Rothe, the Virgil figure, is about to part from Carter just like in the earthly Paradise, on the top of Purgatory. Rothe is blinded by the smoke of his cigarette and the neon lights. This is surely an allusion to the two rivers flowing through the terrestrial paradise; Lethe on one side and Eunoe on the other, but both deriving from a single, divine source. Le Vestibule des lâches is a condensation of Dantesque topography. When Carter and Barquet leave the «Mortimer», they continue down rue Verdaine until they reach the lake. This is Lake Cocytus, the frozen lake of the ninth Circle. Notice the sentence: «Les drapeaux de Fabrice Gigy claquaient, quelques cygnes glissaient insensibles au froid sur l’huile nocturne et cobalt du Rhône.» The river sinks into the lake at this very place. The closeness of the words cobalt / cygne can be seen as an allusion to the French Cocyte / Cocy-tus in English. Plus Fabrice Gigy's flag: it's a hint, in the vestibule, of those who have avoided choosing between God and Satan, and are condemned to follow a white empty banner, stung by wasps. Fabrice Gigy has installed on the bridge a series of white flags with a black circle on the bridge – the point at the bottom of the infernal cone. Other sentences like «Ils traversèrent l'artère au feu rouge et remontèrent la rue de la Terrassière» show hints for the terraces of purgatory. «Ils traversèrent au feu rouge»: purification by fire. The 7th Terrace is surrounded by flames. Dante walks through the fire at this moment. Just before he enters the terrestrial paradise. Finally the train that leaves to take away Rothe gives us obvious allusion. «Ils regardèrent encore la grande horloge Mondaine qui indiquait presque 10:50. Il restait dix minutes jusqu'au départ du train. Et cinq jusqu'à l'éclosion des étoiles.» We have clear refrence to Beatrice's magical number. «Cinquecento diece e cinque» and the star, «l'étoile» is of course the last word of Purgatory. In short, the dantesque elements that we find in Fretz's novel show his effort of confronting an enemy who is also a possible other self. Doing so, the novel can be looked at as the narration of a fragmented mirror tile as much as a moral tale.